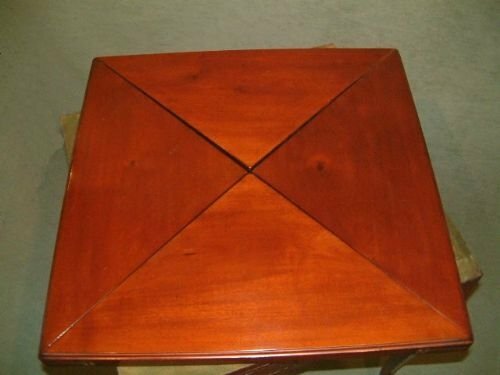 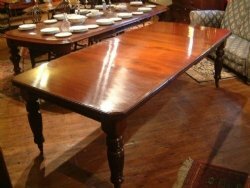 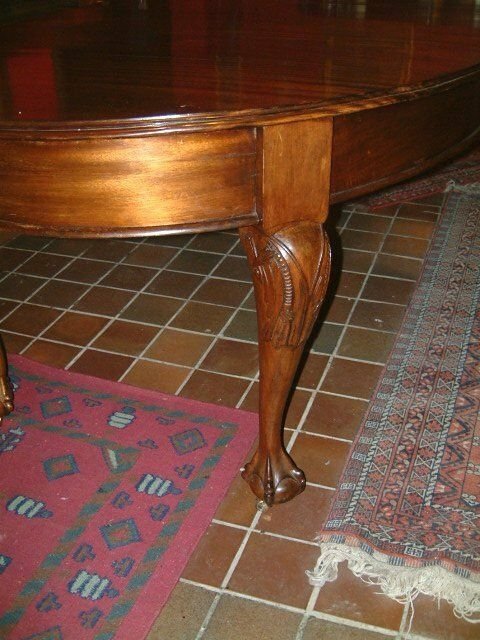 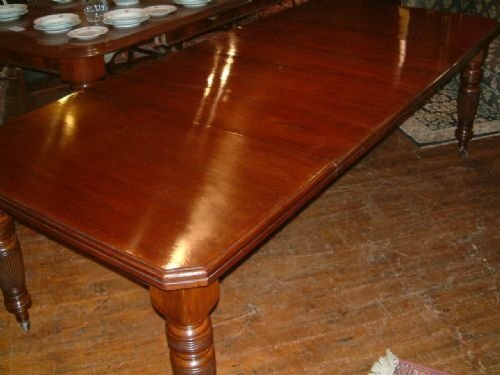 Edwardian Chippendale Revival Mahogany Extending Dining Table with 3 Leaves the Nicely Figured Tops Supported on Carved Cabriol legs with Ball & Claw Feet. 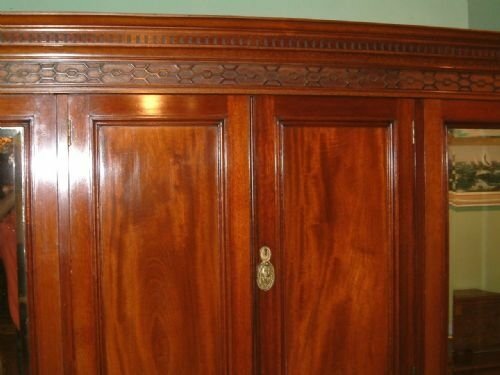 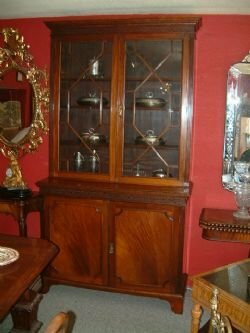 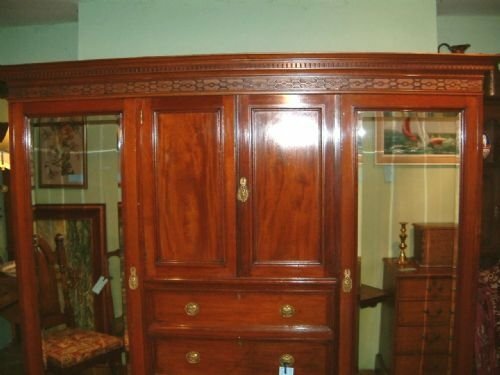 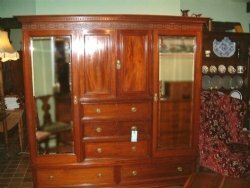 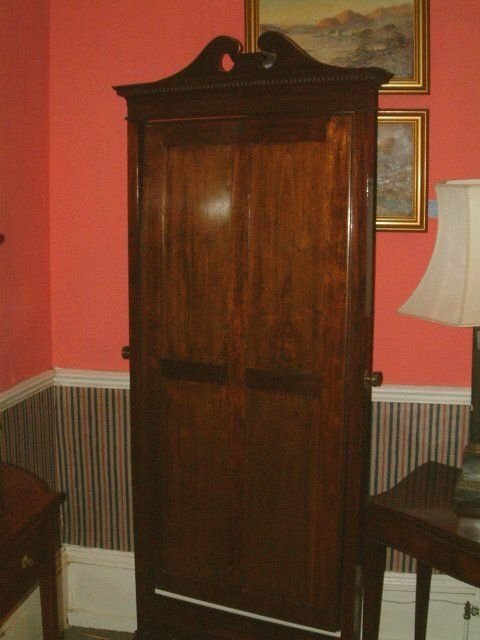 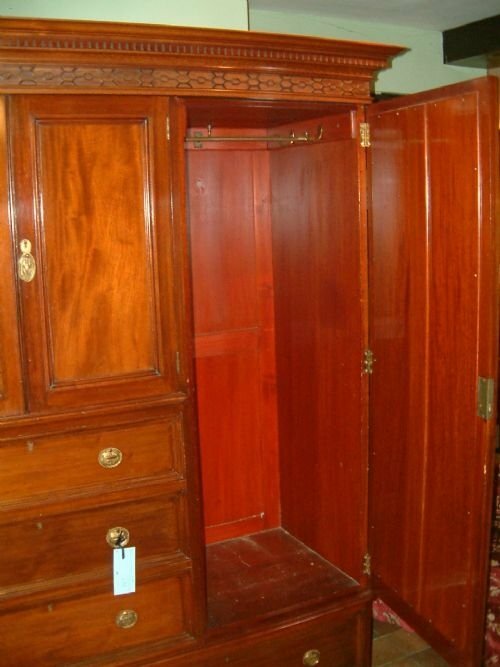 Edwardian Chippendale Revival Mahogany Glazed Bookcase, the Astragal Glazed Top Section Above a Two Door Cupboard with two Drawers. 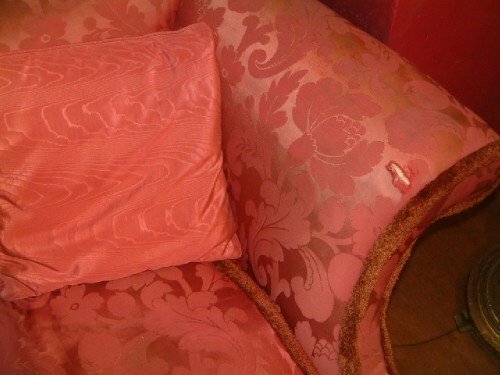 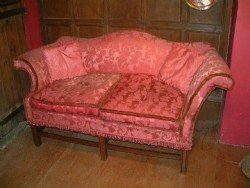 Edwardian Chippendale Style Camel Back Sofa with Red Damask Upholstery Gently Distressed on the Arms Supported on Chamfered Mahogany Legs with Stretchers. 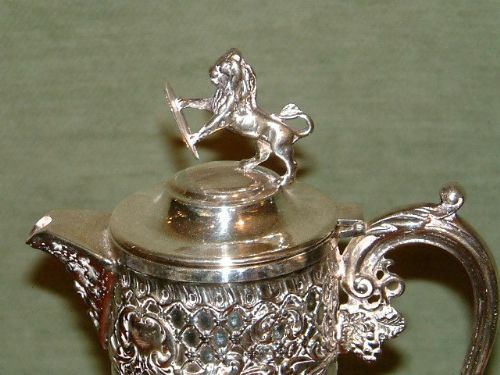 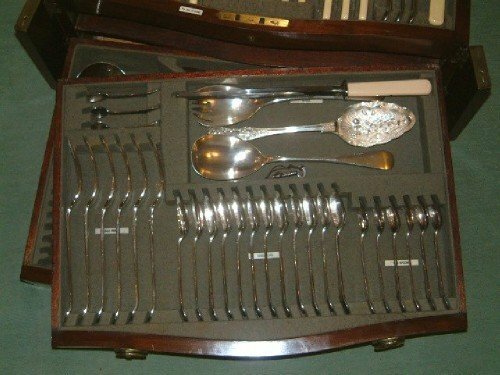 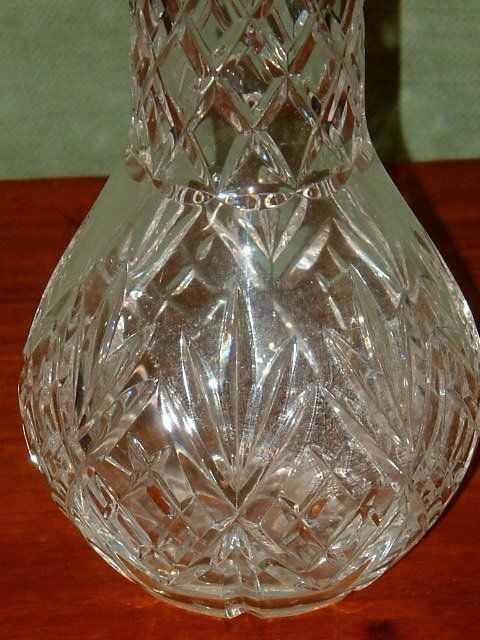 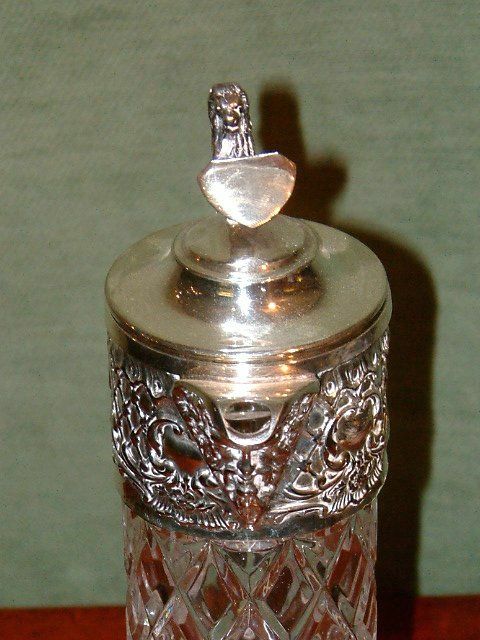 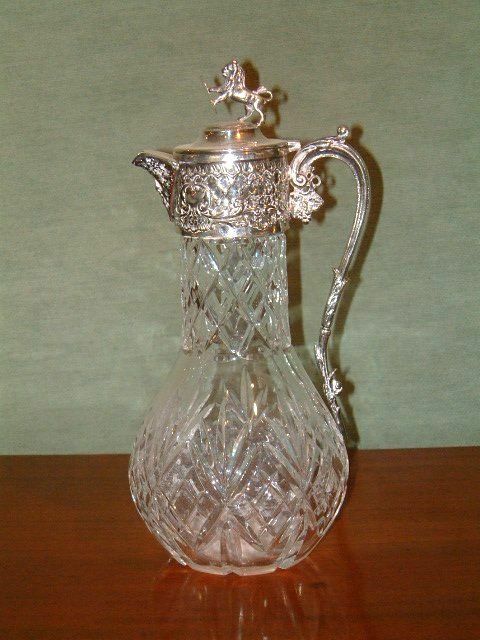 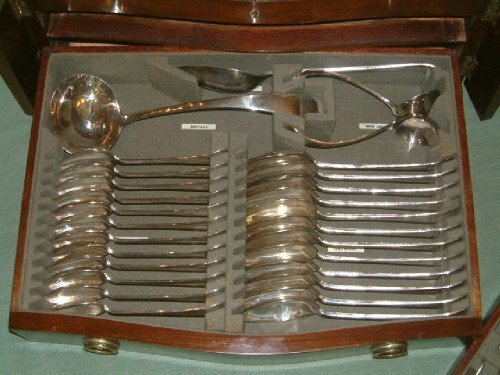 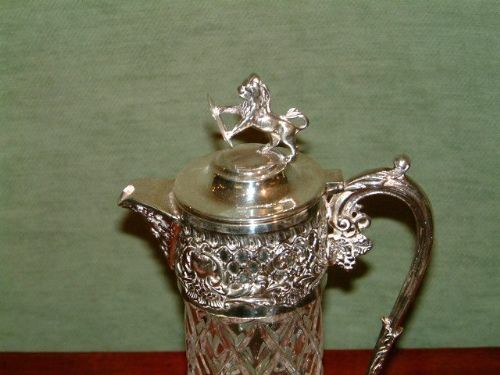 Edwardian Cut Glass & Silver Plated Armorial Claret Jug. 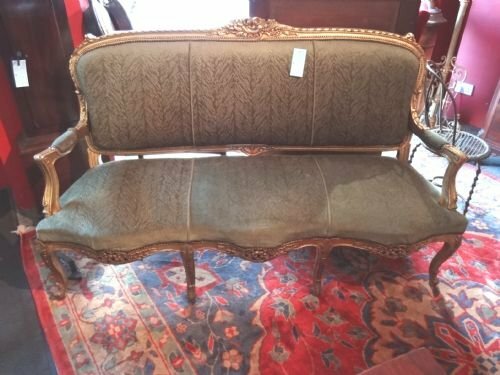 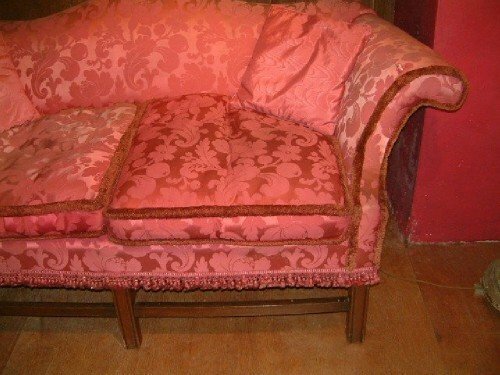 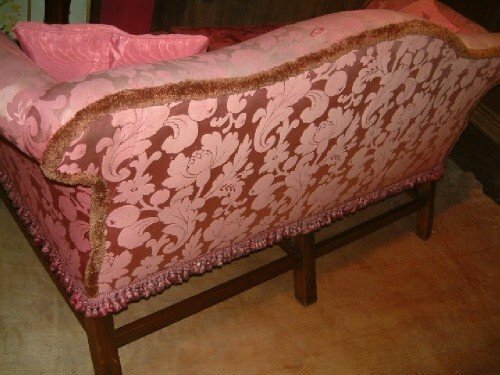 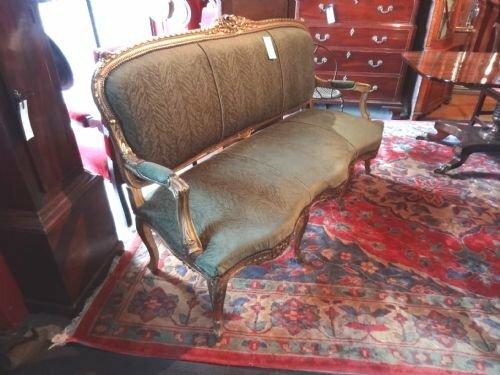 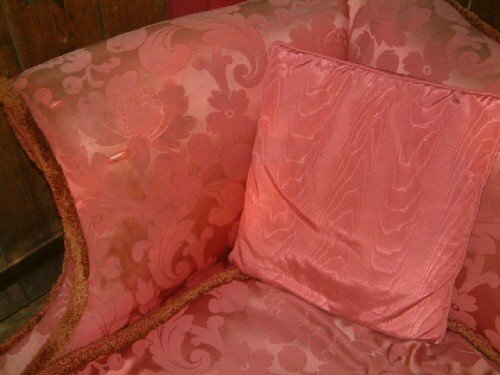 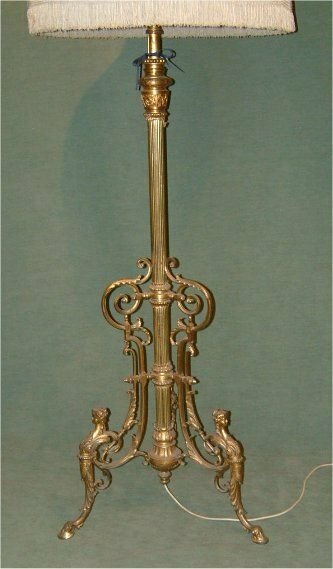 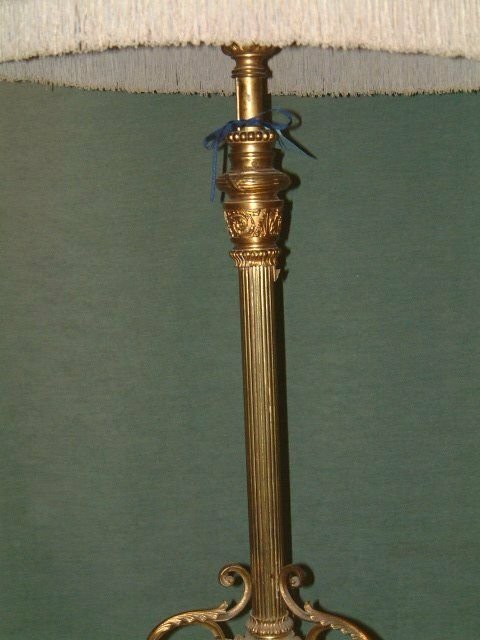 Edwardian French Style Giltwood Settee, with Nice Cabriol Legs and Well Carved Top Rail. 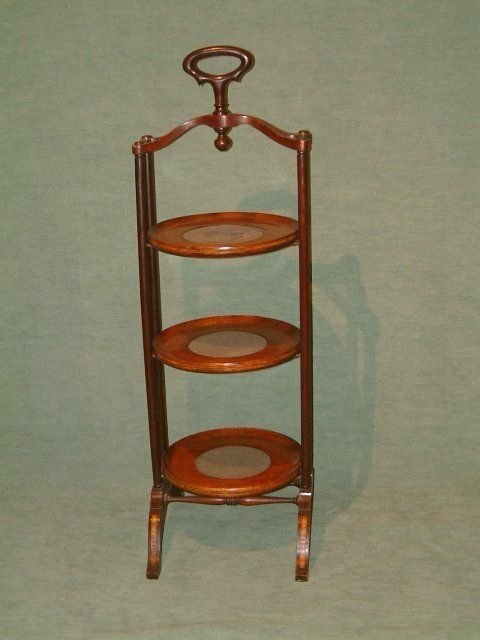 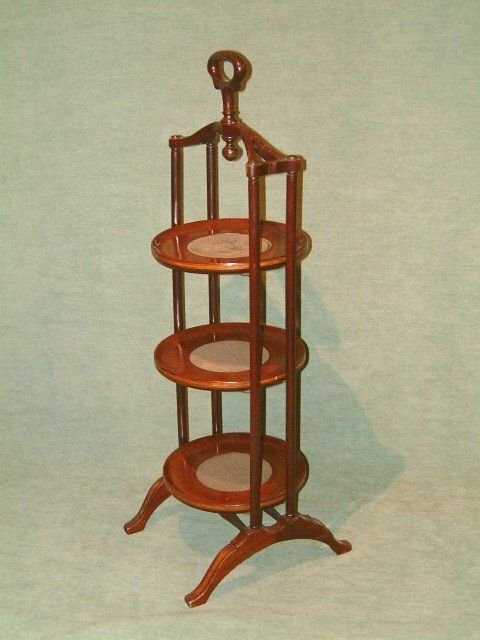 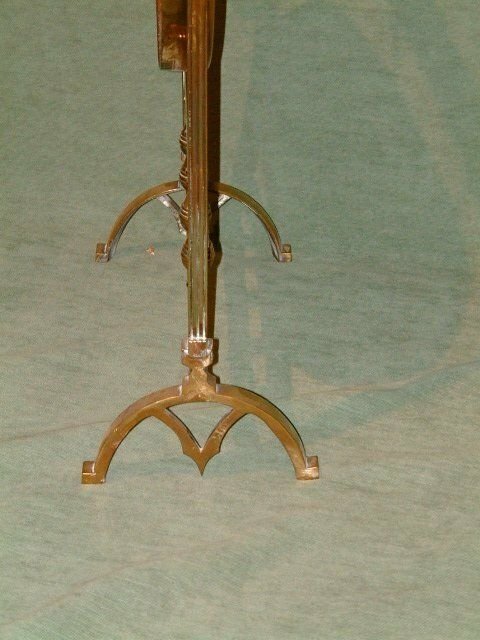 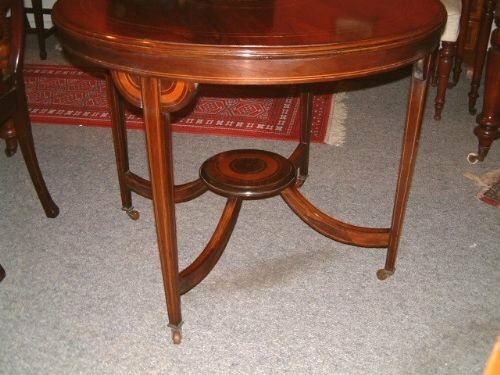 Edwardian Inlaid with Satinwood Banding Mahogany Cake Stand. 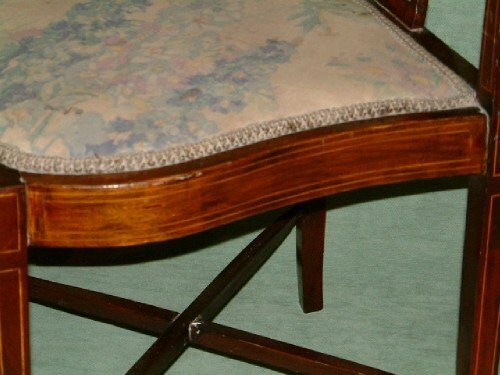 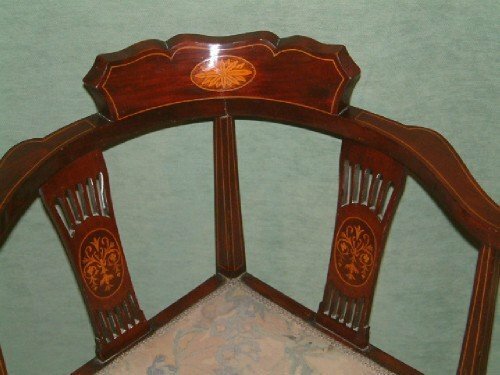 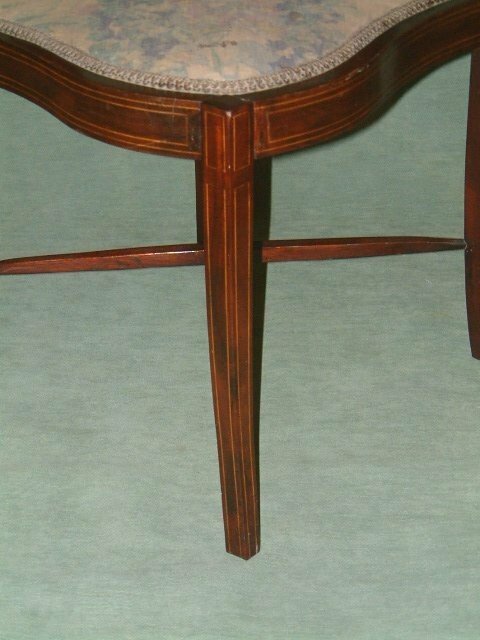 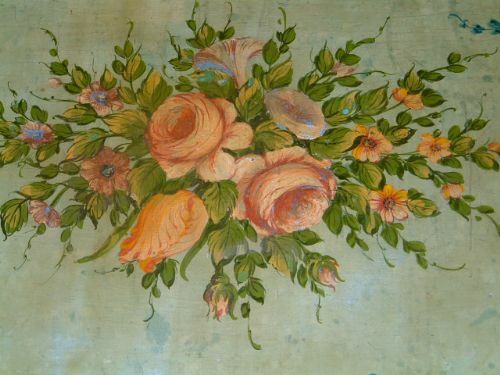 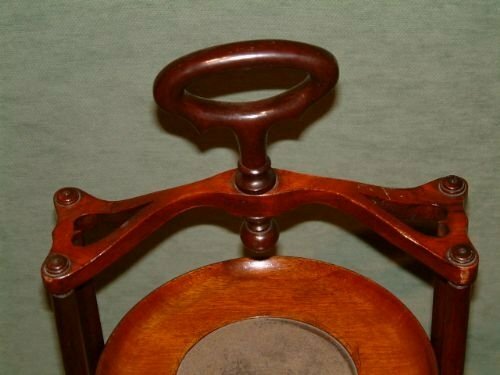 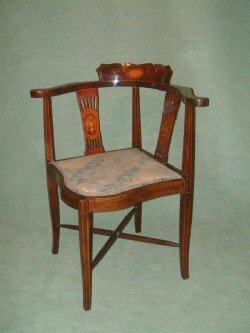 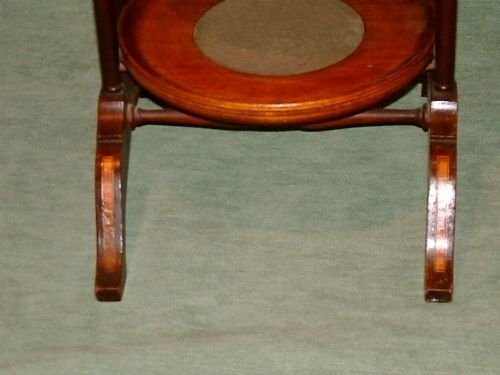 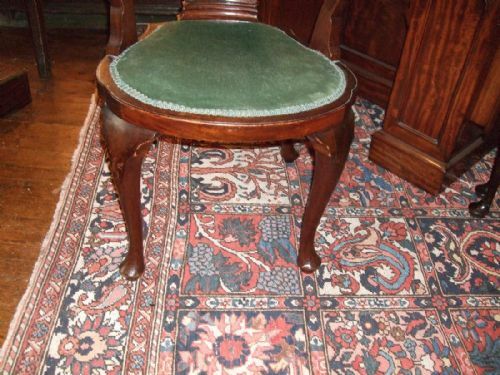 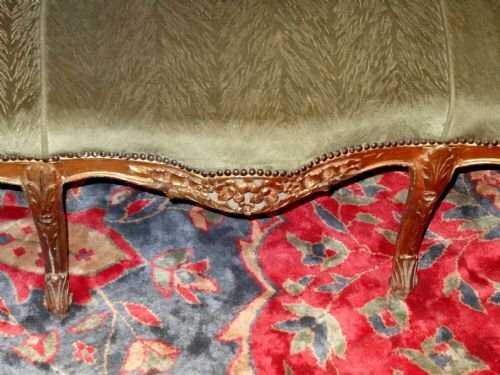 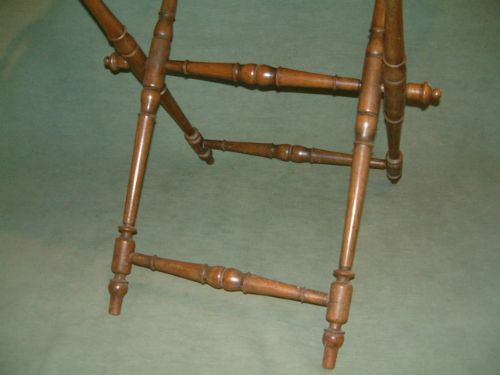 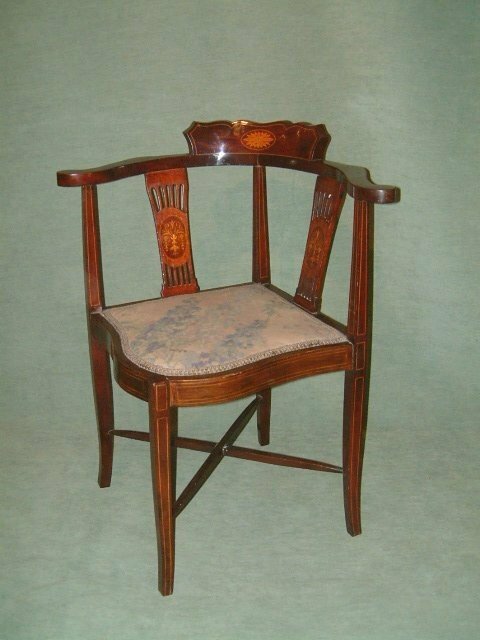 Edwardian Inlaid Mahogany Corner Chair. 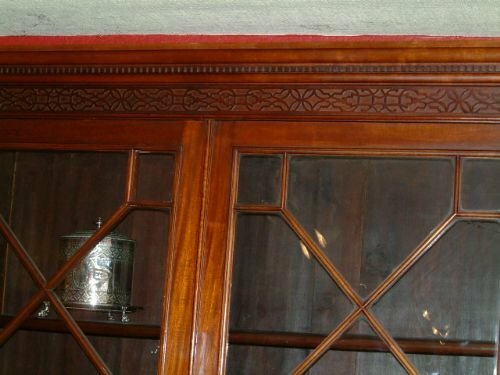 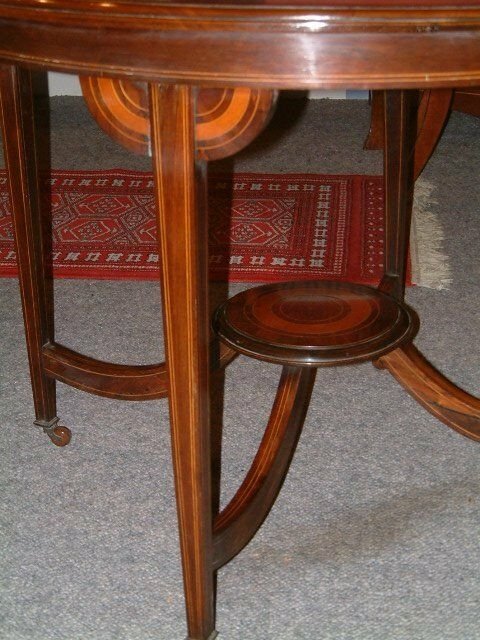 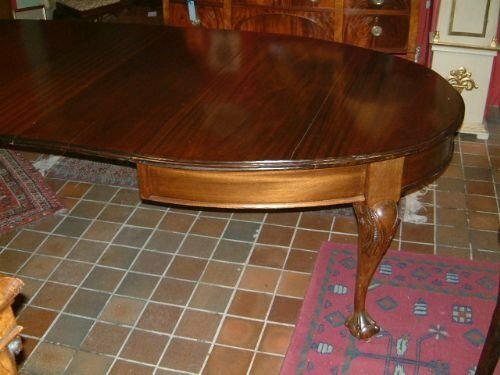 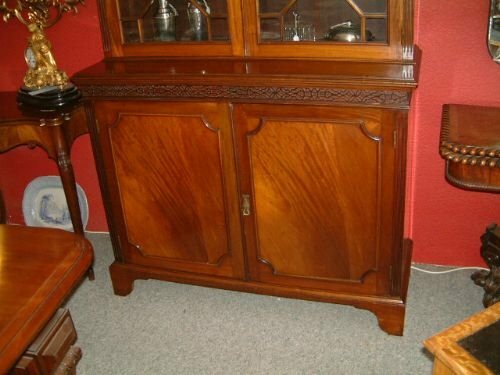 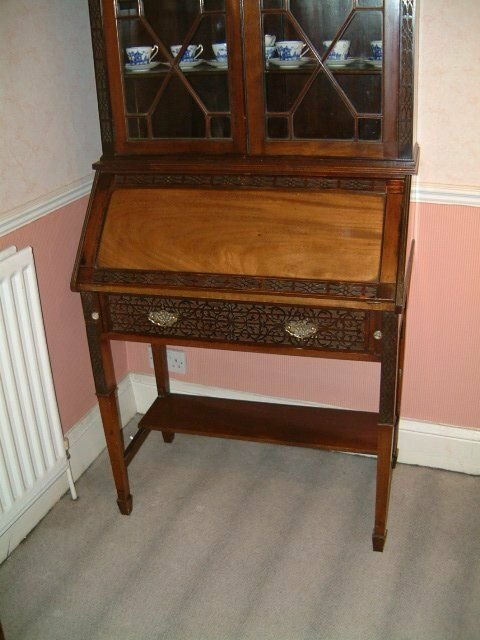 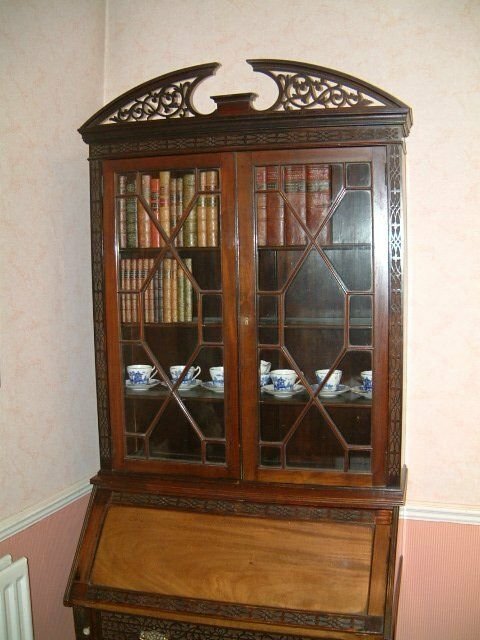 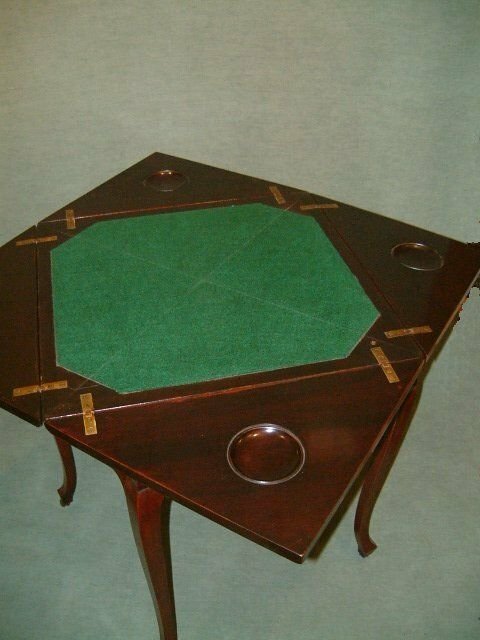 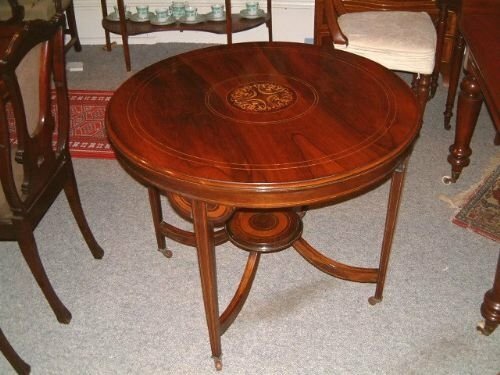 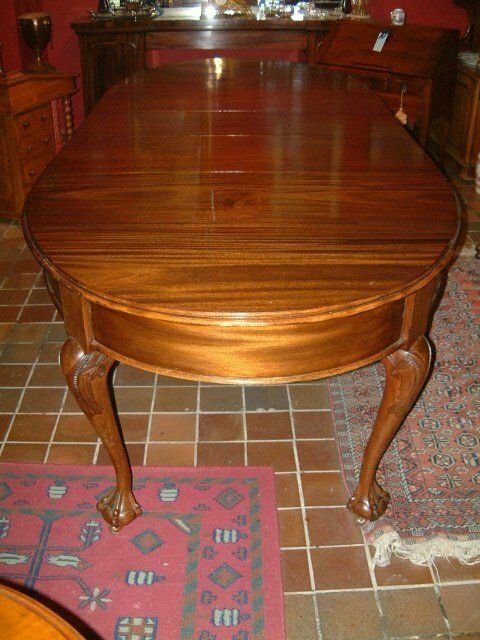 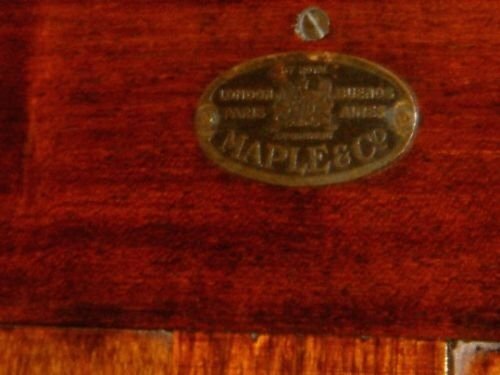 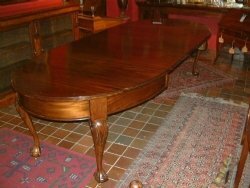 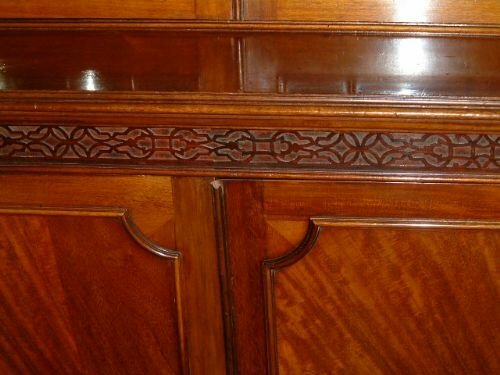 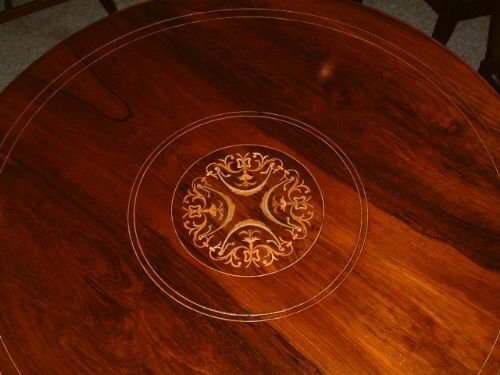 Edwardian Inlaid Rosewood Centre Library Table Sheraton Revival, Beautiful Inlay to Centre. 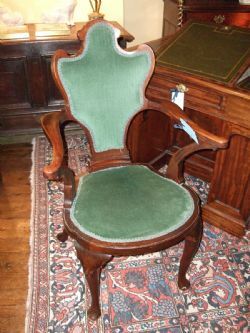 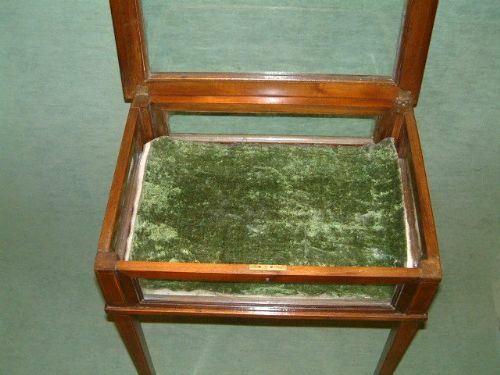 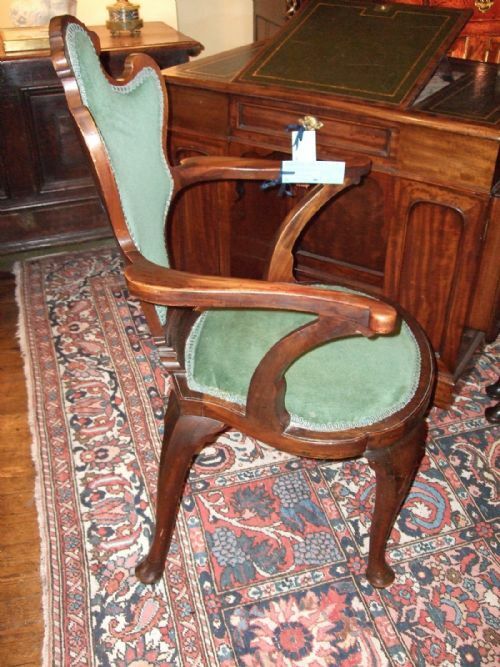 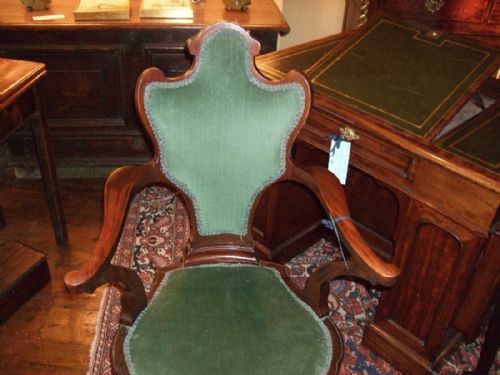 Edwardian Mahogany Desk Chair, Upholstered in Green Velvet. 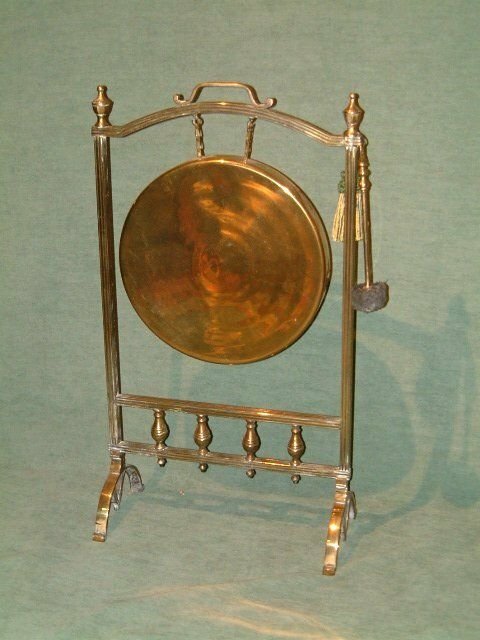 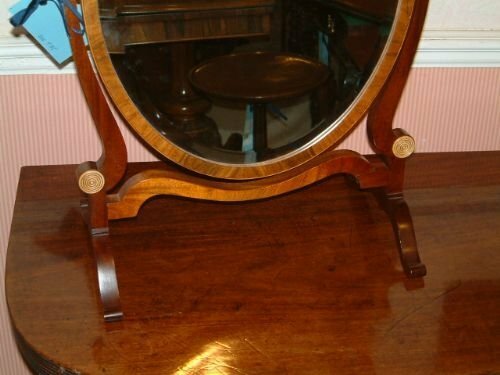 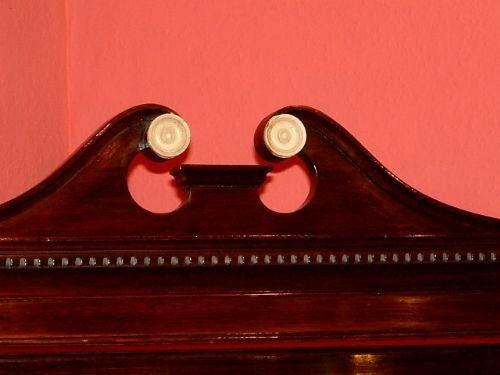 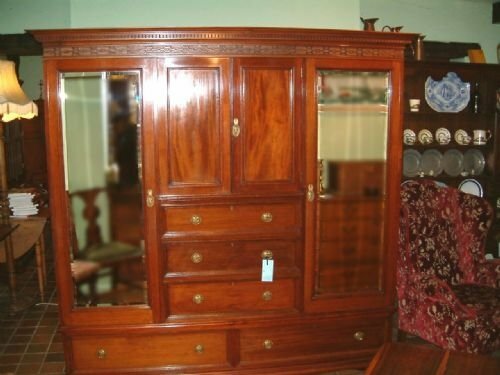 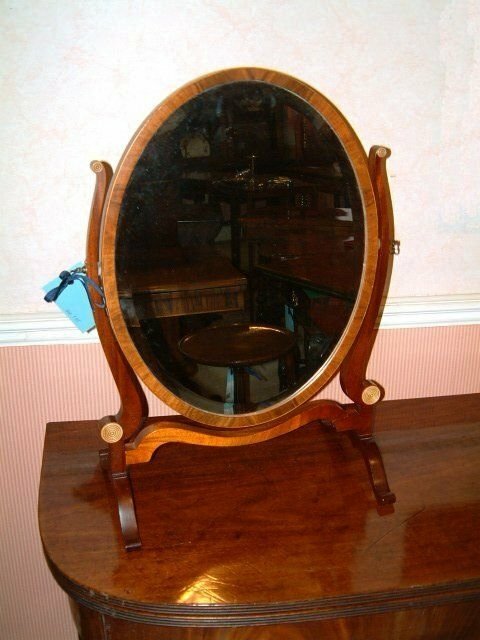 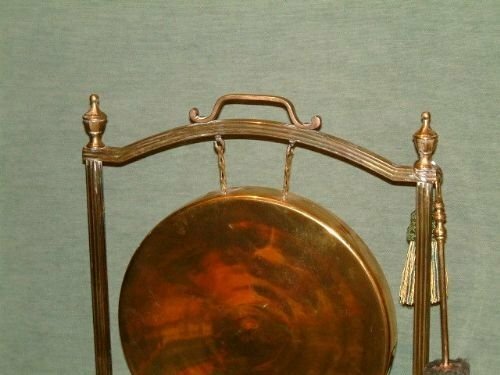 Edwardian Mahogany Dressing Mirror the Crossbanded Mirror Frame Surmounted by a Shaped Stand with Ivory Roundels. 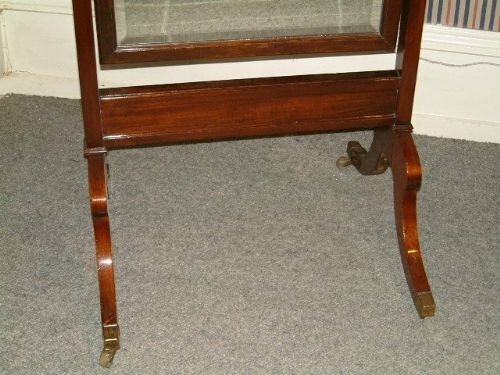 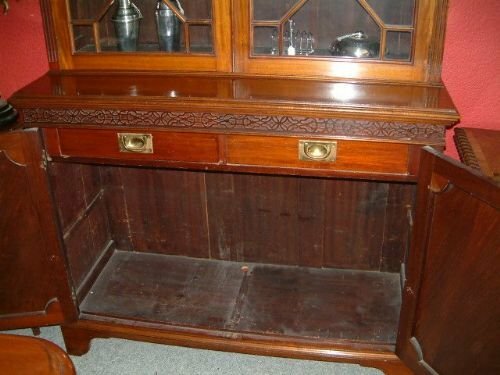 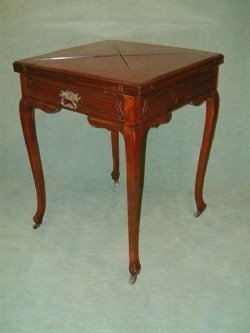 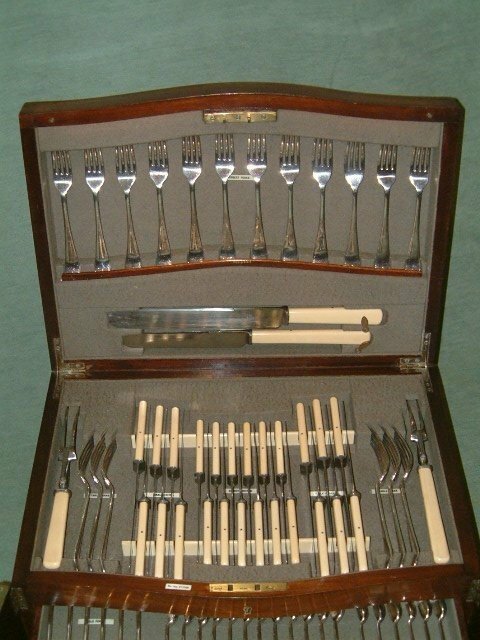 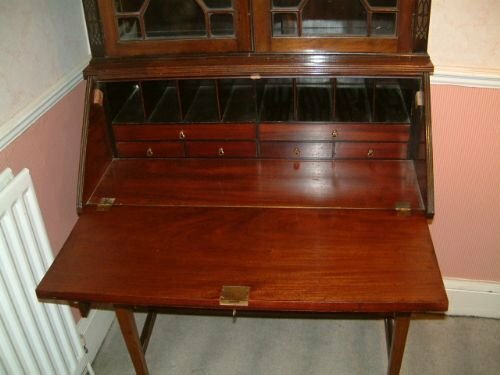 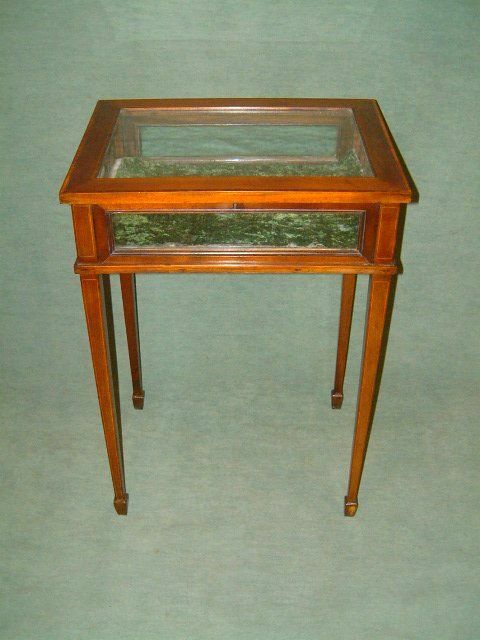 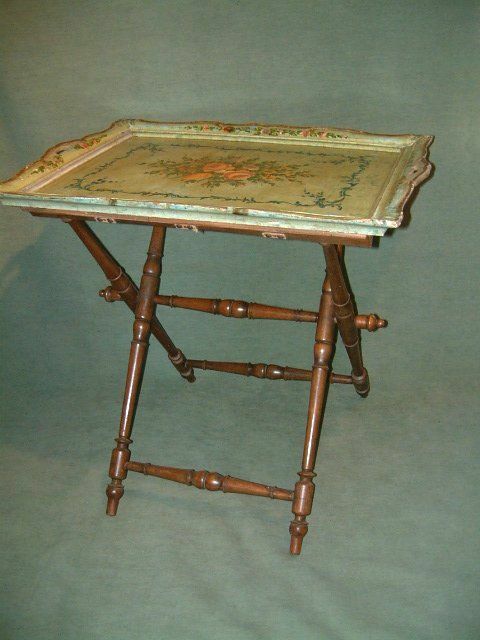 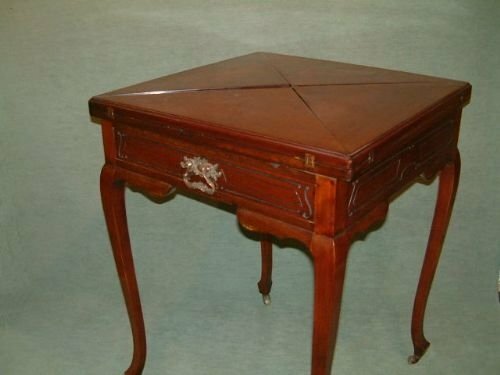 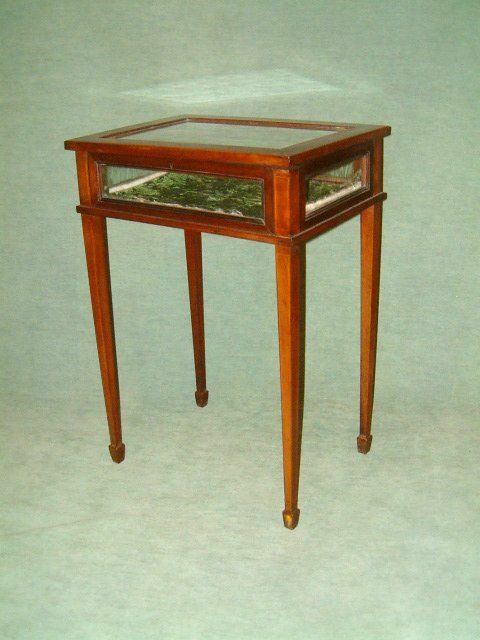 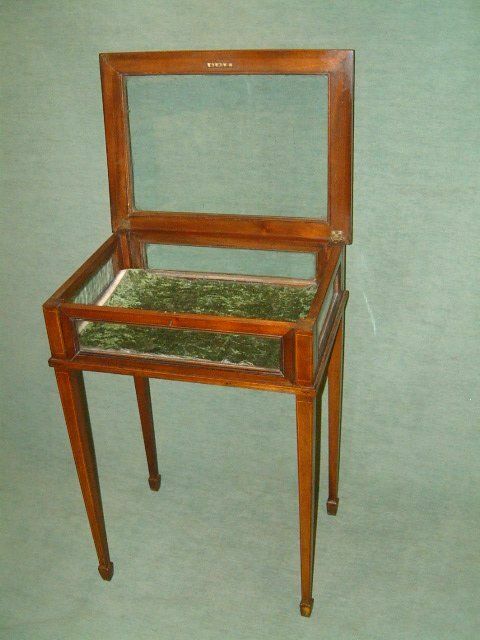 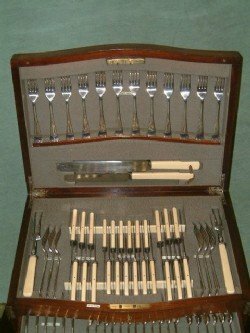 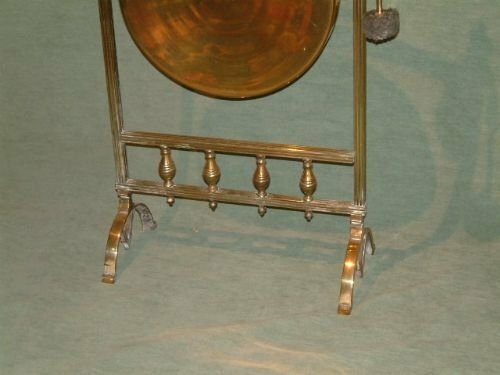 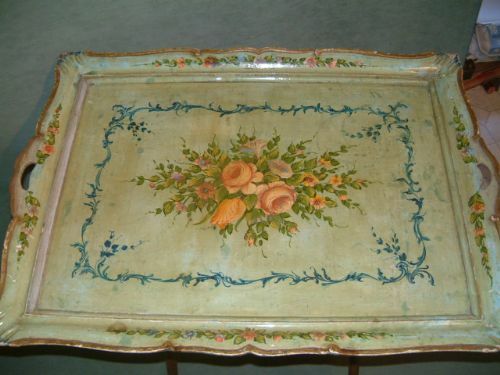 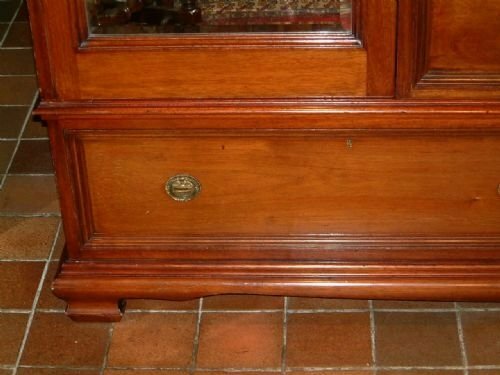 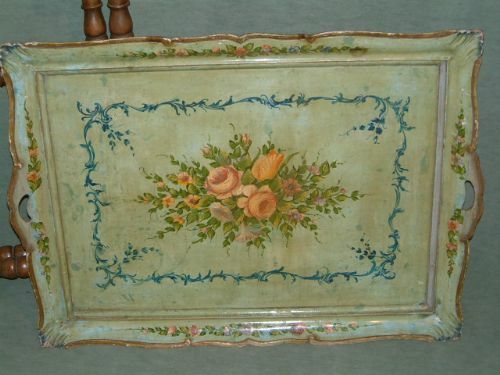 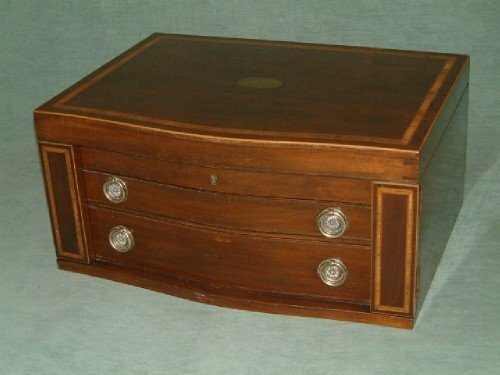 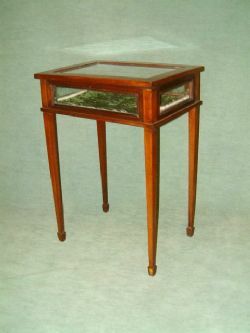 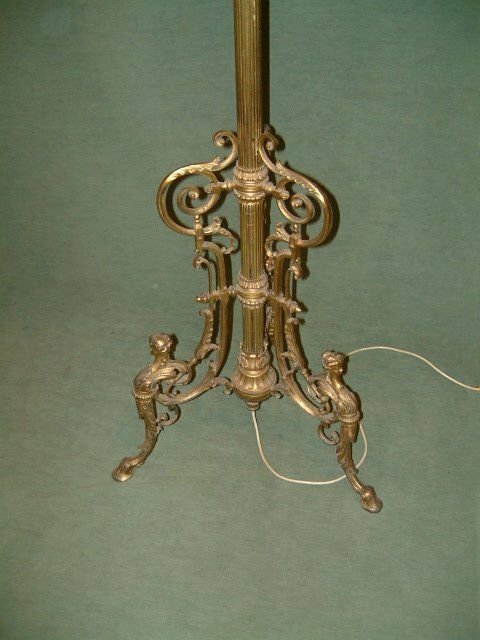 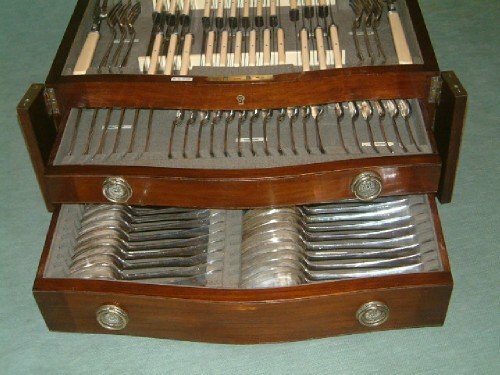 Edwardian Mahogany Envelope Card Table with Drawer,with Carved Decoration, Nice figuring to the Mahogany, with Counter Wells and later Green Baize, Supported on Brass Casters. 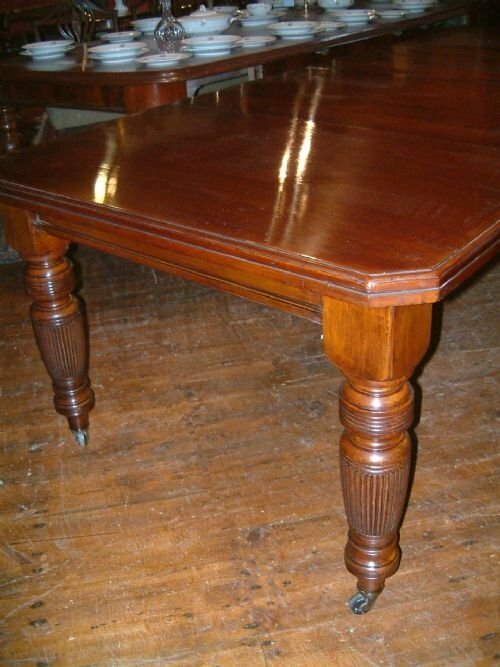 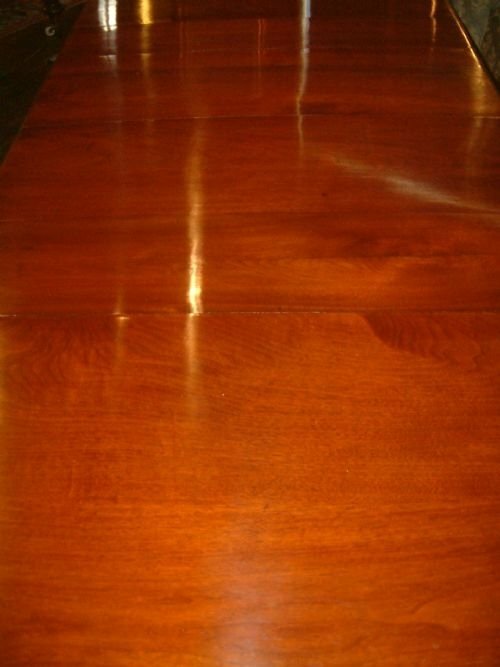 Edwardian Mahogany Extending Dining Table with Original Leaves (x3) with Windout Mechanism Lovely colour and Figuring to the Top, Supported on Reeded Legs with Brass & China Casters.